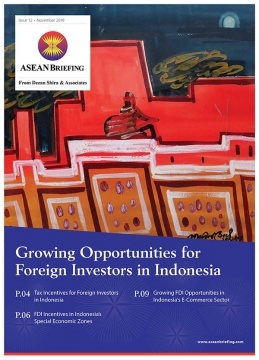 In this issue of ASEAN Briefing magazine, we focus on emerging FDI opportunities in Indonesia and highlight the country’s potential as a sound investment destination, including for those looking to shift a part of their production lines from China to ASEAN. We begin by describing the tax incentives available for foreign investors in Indonesia. We next focus on Indonesia’s Special Economic Zones as potential locations for FDI projects. Finally, we analyze the growing opportunities for foreign investors in Indonesia’s lucrative e-commerce sector. A large domestic market of middle class consumers, competitive labor costs and an entrenched export-oriented manufacturing sector make Indonesia an attractive choice for investors looking to expand their operations in ASEAN. Recent economic headwinds notwithstanding, the country has maintained political stability, and has created a reasonably sound business environment. Indonesia’s leaders have also taken several recent steps to expedite FDI reforms and cut red-tape for potential investors. Most recently, the government in November 2018 announced a significant liberalization of the country’s Negative Investment List whereby some 54 business sectors, where foreign investment was previously either prohibited or restricted, are to be now opened up to full overseas ownership. Indonesia has also announced a raft of tax incentives for foreign investors. These include corporate income tax exemption of up to 100% across the majority of the country’s business sectors for varying periods of time depending on the amount of capital invested. In this issue of ASEAN Briefing magazine, we focus on these emerging opportunities and highlight the country’s potential as a sound investment destination, including for those looking to shift a part of their production lines from China to ASEAN. We begin by describing the tax incentives available for foreign investors in Indonesia. We next focus on Indonesia’s Special Economic Zones as potential locations for FDI projects. Finally, we analyze the growing opportunities for foreign investors in Indonesia’s lucrative e-commerce sector.